A world doused by acid rain downpours that have kept it devoid of vegetation, Vjun is a foreboding planet steeped in the Dark Side of the Force. The wealthy noble family House Malreaux called Vjun home, until its misguided member, Viscount Malreaux, unleashed forbidden genetic experimentations that led to a deadly psychosis. As a result of that madness, most of their numbers were murdered in cold blood. During the Clone Wars, Count Dooku used the abandoned Chateau Malreaux as a temporary base of operations. On Vjun, Darth Vader built Bast Castle, a remote, heavily-defended structure that was his private refuge. 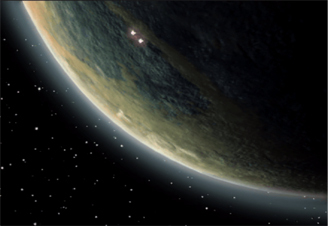 The planet later served as the headquarters of Dark Side Executor Sedriss and the Emperor's elite force of Dark Jedi, including Kam Solusar. Luke Skywalker turned Solusar to the Light Side six years after the Battle of Endor. Soon after, three Ysanna prisoners from Ossus were taken to Vjun to serve as raw material in creating new clone bodies for Emperor Palpatine. The Ysanna were frozen in carbonite to await the future construction of a clone laboratory in Bast Castle, but Luke Skywalker and his Jedi trainees managed to storm the castle and defeat the Emperor's minions. During the rise of the Cult of Ragnos -- a secret sect of Dark Side worshippers who were tapping nexuses of Force energy in a bid to resurrect an ancient Sith Lord -- New Republic Jedi agents Kyle Katarn and Jaden Korr discovered and chased away cultists targeting Vjun. Years later, Jedi historian Tionne found evidence that Darth Vader had retrieved Obi-Wan Kenobi's lightsaber and kept it within Bast Castle. She and fellow Jedi Ikrit, Anakin Solo, Tahiri Veila, and Uldir Lochett voyaged to Vjun to claim it and the lost holocron of Jedi Master Asli Krisman before such treasures fell into the hands of Dark Side trickster Orloc.